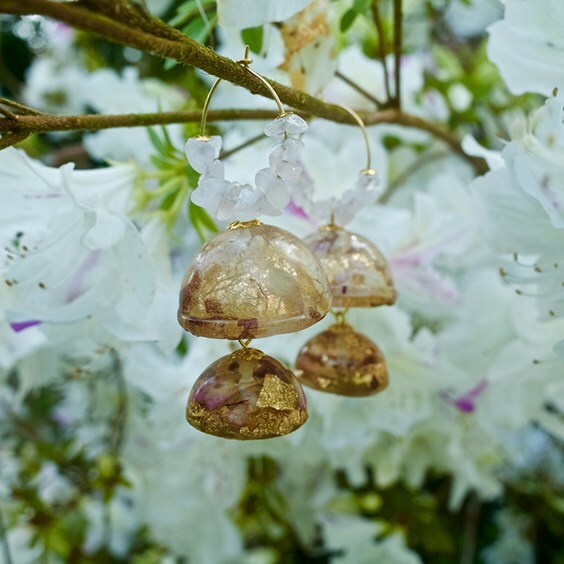 Resin jewellery is fast becoming a popular technique to use among jewellers and in today's interview, we chat to a Ellanor Aquitaine, the jeweller behind 'Arthyan' who creates handmade jewellery using real flowers, resin and gemstones - a dreamy combination! Ellanor's designs are truly special, we absolutely adore how a flower can keep its natural beauty and be cherished for years to come in a piece of jewellery. 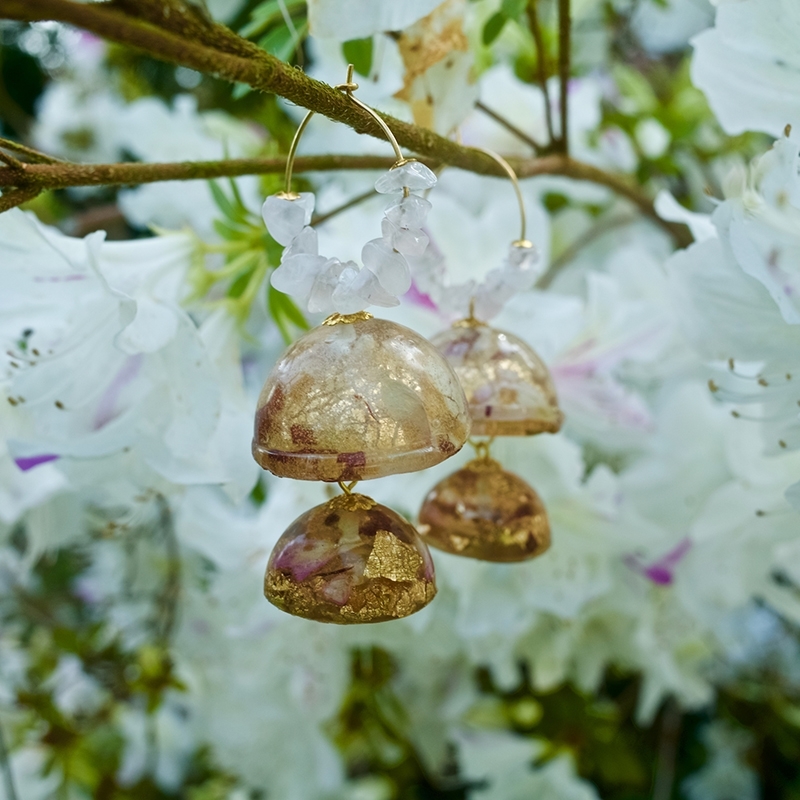 We wanted to get to know more about how Ellanor's jewellery making journey began, the inspiration behind the jewellery and find out her top tips on using resin for jewellery making. With Kernowcraft being located in Cornwall, it was lovely to discover that Ellanor grew up between Cornwall and Devon - so we also wanted to find out how this influenced her jewellery... Read the whole interview below! Read more interviews with jewellery designers here. "jewellery design was my calling - it combined fashion, art, and creative invention in the most beautiful way possible..."
As a self-taught jeweller, how did you get started and what recourses did you use? I've always been creative and eventually it clicked for me that jewellery design was my calling - it combined fashion, art, and creative invention in the most beautiful way possible. I had previously harboured a fascination with fine jewellery but never really considered it achievable as a career until a pivotal moment when I decided I wanted to at least try! Unsurprisingly, I started out with a completely different initial outcome in mind - I wanted to make Japanese hair ornaments called 'kanzashi' and tiaras from wire dipped in resin and sculpted into flower shapes. It didn't work out as I wanted and I ended up abandoning the project for a while and focusing on different artistic interests, which turned out to be the best outcome! The jewellery that you see in its completed form today was conceptualised because I wanted to be able to wear traditional Indian jewellery for my first Diwali spent with my partner, and it wasn't readily available to buy in the UK. I started off making paper quilled jhumka (earrings), but it didn't have the finesse and elegance that I would have liked. Eventually, I had an epiphany that I could experiment with using the resin and flower theme from my previous project to make these unique shapes found in Eastern jewellery whilst mimicking the effects of enamel. Once the first attempt was successful I realised that this was something worth pursuing as I couldn't find anything else like it on the market. 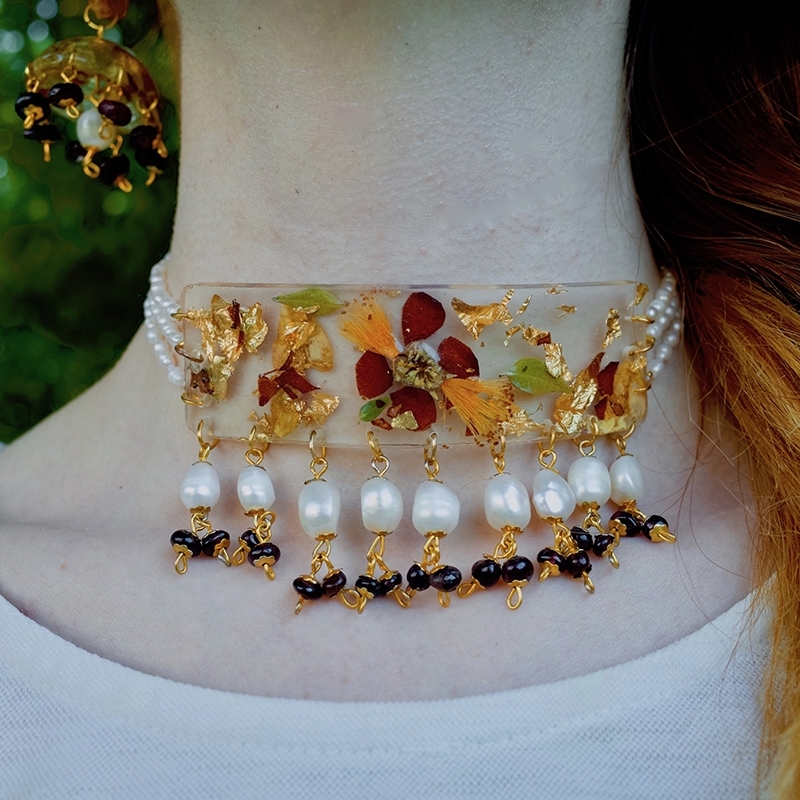 From then onwards I proceeded to pour hours and hours of research into the history of jewellery, from enamelled Art Nouveau and bejewelled Qajar pendants to Rajasthani Aad (Chokers), and the different styles of Nathni (nose rings). As well as the creative research, lots of time went into the science element - silicone mould making and the chemistry behind resin. Eventually, all the research and experimenting culminated to create the finished aesthetic and pieces that you see today! Learning a new craft always takes time (I'd advise setting a year aside for study, research and experimentation), but nowadays there are so many resources out there on YouTube, Instagram, and crafting websites which make the process of self-education really accessible to most people. When you're self-taught you can really benefit as passion always drives the way forward and you have a limitless amount of resources and mentors online to help you. A teachable moment for me throughout the whole process was that what you originally want to do often won’t quite 'fit' and you'll change your path, but that's okay and sometimes even what’s needed. What do you love about using resin? Working in resin gives me the freedom to create jewellery without limitations. 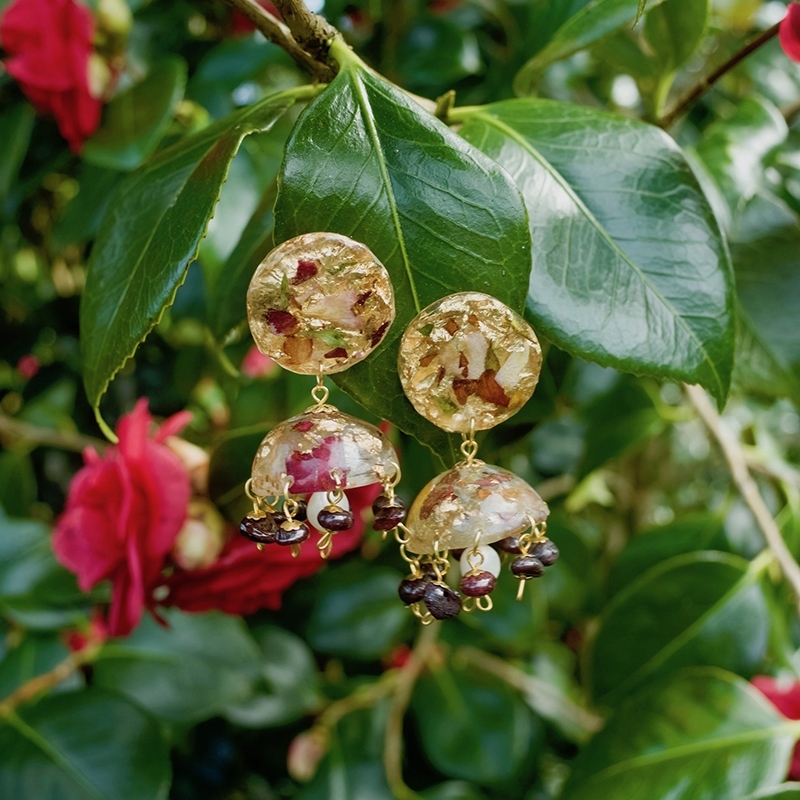 The lightweight nature of resin means that I can create something really extravagant and large such as my jhumka or chandbali earrings without compromising on how comfortable it is to wear - which is great for both my creative expression and for the comfort of my customers! Aside from that, making handmade jewellery accessible to everyone is very important to me and I have developed a range of products which are suitable for everyone's budget - something I may not have able to do if I was working in another material. What top tips would you give to someone wishing to try resin for the first time? Always ensure you're working in a well-ventilated area or preferably outdoors. Wear gloves when working with uncured resin and a mask and eye-googles to do any sanding or drilling. Gaining an understanding of how resin works takes time, but you can make things easier by doing research into the different types of resin and how they work, which will make your time more productive and ensure that you don't waste too many materials. "You'd be surprised how many fresh and beautiful flowers there are fallen under trees and bushes at the right time of year..."
Handmade jewellery which is an intriguing juxtaposition between antique and modern, East and West, feminine and bold, statement and delicate. I really enjoy the resin inclusions. That's the technique of putting something inside the resin to preserve it - I use dried or pressed flowers and gold leaf. It's probably the most creative part of the process where you can have the most fun - I love arranging the flowers and picking the colour combinations and symbology of each piece, as that's really when the whole form begins to come together. Sometimes I let the resin move the flowers in a natural flow, and sometimes I like to arrange them in a certain pattern so that they stay in place. Aside from that, I’m enamoured with bead weaving. It's something I haven't done much on my current work for sale, but at the moment I'm experimenting with it and I'm really excited to see how it will look on a finished piece. An example of this would be the Nathni, which is a traditional nose-pin from the state of Maharashtra in India woven into a unique 'flower' shape that bends around the curve of the nose and looks really beautiful when worn. 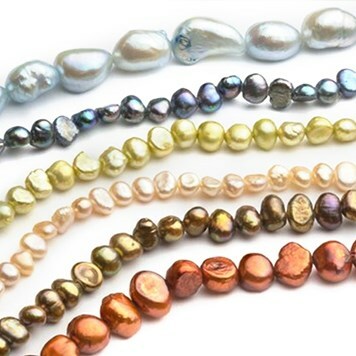 Browse Kernowcraft's gemstone bead range here. We love your combination of flowers and gemstones, what is your favourite piece of jewellery you’ve ever made and why? I couldn’t decide! It really depends on my mood - the first piece of jewellery I ever created will always have a special place in my heart. 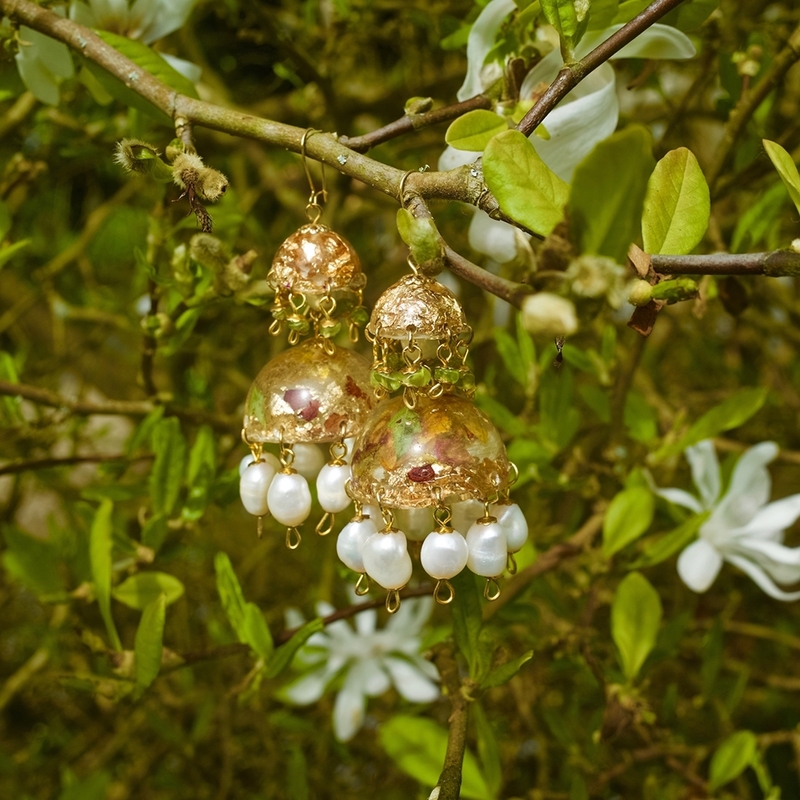 It’s these Jhumka earrings made with roses, garnets and freshwater pearls which symbolise my success. A pair of Chandbali earrings I haven’t got around to photographing yet are the most extravagant, decadent and royal thing I’ve ever made - I love them! They’re in the shape of a crescent moon filled with yellow summery flowers and I’ve attached hundreds of rice pearls all around the bottom curve of the moon. The moon hangs by a chain attached to each point which meets in the middle at a tiny diamond shaped stud. Top 3 gemstones you love using in your designs! Definitely pearls, especially seed pearls - I use them in almost every design because I just adore the classic sophistication and romance of them! 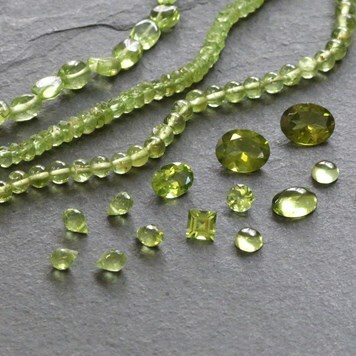 Then peridot - I think it goes particularly well with my jewellery because it's gorgeous bright green colour reminds me of the sun shining through leaves. Finally, I'll have to say fluorite. Although I haven't used it in one of my designs yet, I have some pieces sketched out which I think are perfect for it. 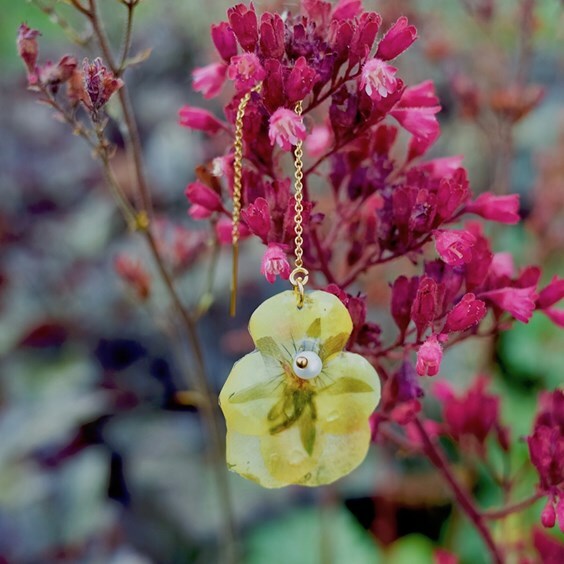 How do you source the flowers in your jewellery? I'm a bit of a hippy at heart! I'm not a big fan of picking flowers that are still growing, so whenever I'm out and about I harvest the flowers which have just fallen. You'd be surprised how many fresh and beautiful flowers there are fallen under trees and bushes at the right time of year. I love to visit gardens, moorlands and national parks, so that gives me plenty of opportunities to gather them - whenever I visit the countryside I make sure to look for flowers whilst I'm there. It also means that all the flowers I use have sentimental memories behind them! Otherwise, I actually grow my own flowers. I love waking up in the morning and seeing a bright and beautiful garden outside my window where we have many pots full of fuchsias, pansies, lobelia and other little flowers. Most importantly, it's essential to me that I source my own flowers by gathering them or growing them as that way I can ensure that they're totally natural with no dyed colours. I also offer a custom ordering service on my website where brides-to-be can arrange for me to make their wedding jewellery for them or actually use the bouquet from their wedding to make a gorgeous keepsake to remember that special day forever. Of course, any occasion can be commemorated and memorialised in this way which makes it a really unique gift. 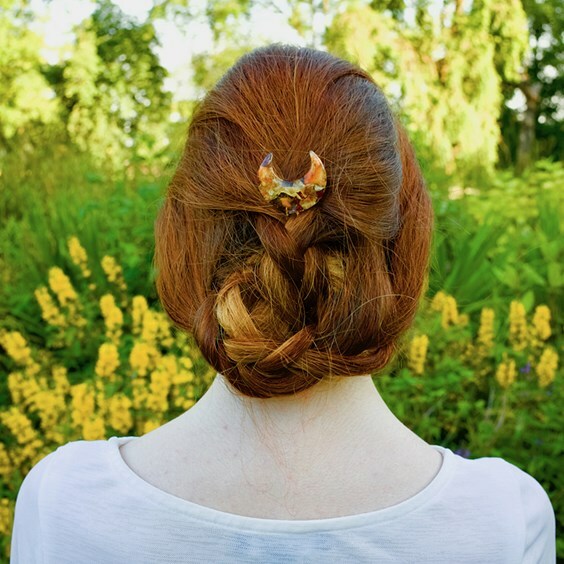 "You can find a whole world of life, memories, love, and days and days of sunny summer moments captured within one piece of jewellery..."
Your hairpins are beautiful, tell us more about your design process of these! Thank you so much! They're always a big hit whenever I attend craft exhibitions. I wanted to create a classic and timeless piece of jewellery that really epitomised elegance without effort, and hairpins fitted that description perfectly. I think it's a huge shame that we don't see them featured much in mainstream fashion - but I'm hoping that Arthyan will help a revival come about! The design is inspired by Indian hair accessories called 'ambada' or 'juda' pins, which are large moon shaped pins meant to be worn in the middle of a bun for traditional events or marriages. I think the moon is universally seen as a really romantic motif and associated with the feminine - I use crescent moon shapes in a lot of my jewellery, like my chandbali earrings ('Chand' literally means 'moon' in Hindi). I also make round hairpins which are supposed to symbolise the sun, and I'm thinking of creating packs of mini pins with single flowers - watch this space! As for the design process, in the majority of my jewellery I use custom made moulds and in some pieces I go even further and sculpt with my hands after moulding the resin. I've been experimenting lately with adding chains with pearls to these hairpins which I think gives it such a delicate and romantic bridal touch, and almost looks like stars hanging from the moon. What’s your favourite thing about using real flowers? I honestly think that being able to wear flowers is such a timelessly romantic and classically feminine idea; from the Indian gajra worn in the hair made of fresh jasmine flowers and long wedding garlands made of roses to the daisy chains we all made as children to wear around our necks, women have always loved adorning themselves in flowers. Throughout the history of mankind, you can see that all over the globe a similar theme prevails in jewellery - we have been trying to capture the beauty of flowers in so many materials; metals, enamels, and carvings... Being able to encapsulate (literally!) 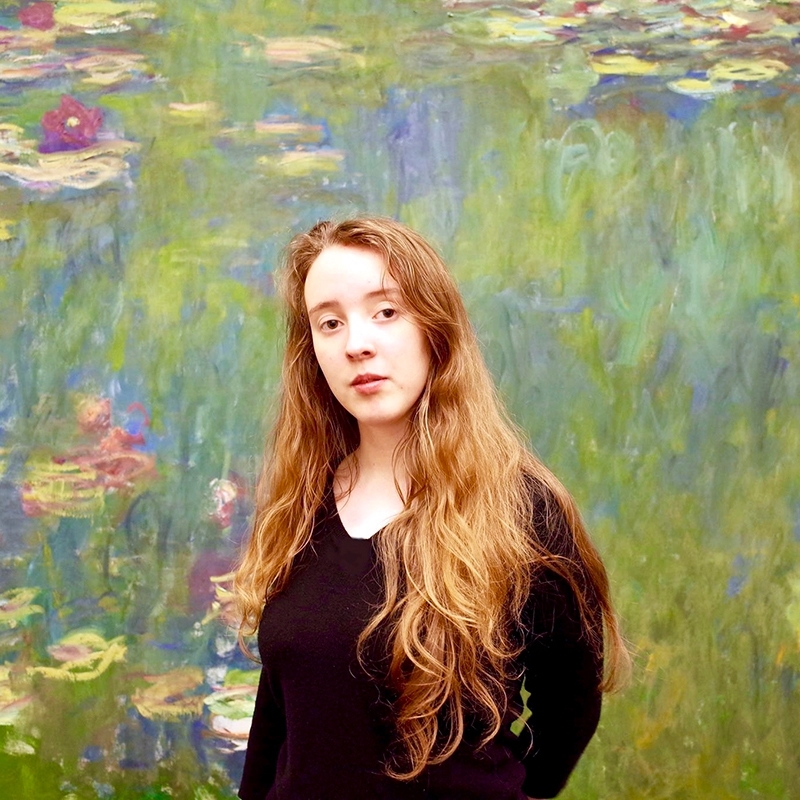 the fleeting moment of a flower in full bloom forever is a rare thing, an indescribable privilege. Instead of trying to recreate the beauty of natural wonders, I'm able to work with them and create a union between man-made beauty and naturally occurring beauty. You can find a whole world of life, memories, love, and days and days of sunny summer moments captured within one piece of jewellery - I think that's something truly special. 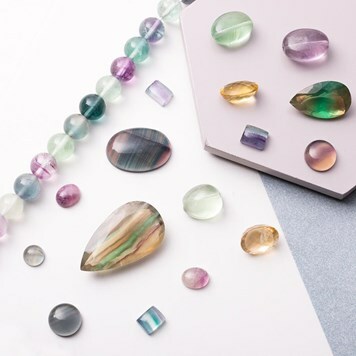 "It seemed to be a truly magical and mystical thing that the Earth could give up to us such an array of absolutely awe-inspiring gemstones..."
What inspires your handmade jewellery? The first and most important thing to inspire me was love: love and passion for putting my hands to work creating something beautiful, which is an interest I don't think I'll ever give up, and love and passion for my partner - that's where my journey towards handmade jewellery started, and it continues to inspire me to create beautiful things every day. I couldn't have created Arthyan jewellery without due credit to each and every era of craftsmanship throughout history that has captured my heart so far - but by taking bits and pieces of all those amazing things I love, I have managed to rework them into something uniquely different: traditional jewellery taken into the modern age as nobody else has done. It all started when I saw Art Nouveau designer Rene Lalique's jewellery at the Museum of Applied Arts in Budapest and Indian jewellery in the South Asian rooms of the Victoria and Albert Museum in London - I had seen nothing more beautiful. To break it down, I'd say that the use of flowers in Arthyan jewellery was inspired largely by the themes of whimsical, natural beauty and botanical natural motifs present in Art Nouveau - my brand image also focuses heavily on the whimsical feminine. The form and structure of the jewellery which is almost sculptural in essence hark back mostly to Indian and Qajar dynasty jewellery; the Jhumka's bell shape I consider to be somewhat reminiscent of church bells or a hanging fuchsia flower, and it’s prevalent in ancient jewellery from North Africa and Greece, all the way through to India. Qajar jewellery is also heavily focused on colourful enamels and is laden with gold, which you can see reflected in the gold leaf I use within my pieces. 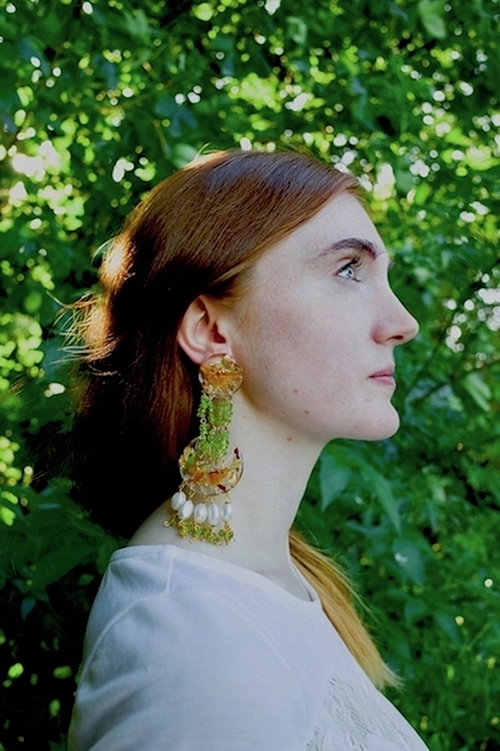 Finally, Byzantine jewellery also boasts some really fascinating and uniquely shaped earrings - but I found most interesting their use of gemstones, often rough-cut and yet always gorgeous. Although you can often find precious stones such as sapphires and diamond in their pieces they also regularly use sea-glass or other such man-made and semi-precious stones which is extremely visually appealing. Aesthetically I loved the look of rough, uneven shaped gemstones with contrasting colours so I adopted it within my own jewellery - I find it makes the piece far more interesting! Did growing up in Cornwall influence your designs, if so how? Definitely! I grew up right between Devon and Cornwall and my childhood was spent exploring, hiking the moors, playing in the woods and swimming endlessly in the oceans. It's an infinitely beautiful area with so much to discover and a wealth of unspoilt natural beauty. I'd say that more than directly influencing my designs, the Cornish countryside actually instilled a love of nature and inspired me to pursue creativity in my life. Ever since I was a young girl I have fond memories of scouring the countryside, moorland, and old mining sites around Devon and Cornwall for minerals. It was a passion of my parents who both had an interest in geology and loved to display the minerals they found around the house. I used to call it "crystal collecting" as it seemed to be a truly magical and mystical thing that the Earth could give up to us such an array of absolutely awe-inspiring gemstones. We had blue fluorite, tourmaline, quartz, topaz, beryl, amethyst and calcite amongst many more - largely people are under the impression that semi-precious or even precious gemstones are only found in exotic countries like India or Madagascar, when in fact we have a treasure trove just waiting to be discovered here! It was thanks to the excitement of finding something new and the pure joy of looking at the shards of light reflected from the brilliant points of quartz that I developed such an immense adoration for gemstones, which you can see in my jewellery today. "In a world full of fast-fashion, being able to own a piece of jewellery that nobody else has is really priceless..."
How do you want your customers to feel when they wear your pieces? I think in today's society the main purpose of jewellery is to make the wearer feel confident, beautiful and empowered. It’s my wish that every customer of Arthyan feels like a Queen, a woodland fairy, a Maharani, a Waterhouse painting - whatever symbolises feminine power and beauty to them. Because each piece is handmade and one of a kind, they’re really special. In a world full of fast-fashion, being able to own a piece of jewellery that nobody else has is really priceless. Hopefully they feel that they are wearing a precious piece of art and nature. I really want to increase my brand identity - both locally in the UK and around the world. I'm especially excited to delve into the international markets of Europe and Asia, because I think there is a larger demand for statement jewellery which will be great for Arthyan. As well as spreading the word about my business, I'd really like to develop more products. I always wanted to create a full 'set' of jewellery, and at the moment I'm really interested in pursuing the goal of making anklets, nose-rings, and stacking rings.